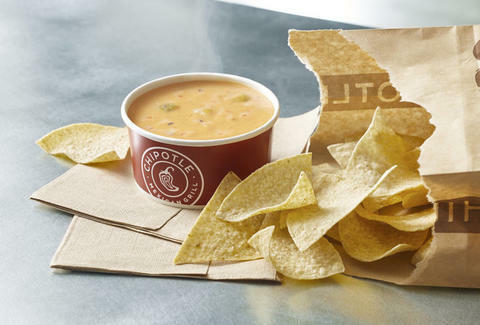 While the generally negative reviews of Chipotle’s new queso are still coming in hot on Twitter, the burrito chain is rewarding early fans of the all-natural cheese dip with a week-long contest for free queso. On Monday, Chipotle launched what’s dubbed the “Queso Cup” on Instagram, promising a year's supply of the hot burrito accessory to five lucky people this week. Starting Monday, and continuing each day through Friday, Chipotle will issue a challenge via it’s official Instagram account, and will award the free queso to one winner per day. While each day’s challenge is mostly up in the air until it's revealed on Instagram, Monday’s clue offered the prize to the first person who was able to spell out “Q-U-E-S-O” in five consecutive comments without interruptions. Chipotle hasn’t officially announced a winner for the challenge yet, but it's safe to say winning will involve some serious social media tactics so set up those posting notifications ASAP for the best chance at taking the Queso Cup. Chipotle also reveals a few hints to what you can expect to face in the next challenges on its official contest rules page. After weeks of extensive testing in some markets and a slight recipe adjustment, Chipotle launched queso nationwide on September 12. Queso’s arrival, however, appears to have spelled doom for the short-lived chorizo meat option, which has been removed from the chain’s menus. Additionally, Chipotle claims its simple queso recipe of only 23 ingredients meets its strict standards for all-natural foods, which is why the texture could throw you off if you’re used to super-smooth queso dips. All said, good luck and let us know you if you bring home the (aged) cheddar. Tanner Saunders once tried to start a cheese fraternity, Sigma Gouda Alpha, in college. They said no.